Pioneer iPod/iPhone interface cable allows you add your iPod to select Pioneer navigation and DVD car stereos, so you can access your iPod with the system's touchscreen controls. You'll see iPod information song and album titles, artist names, and track length — all conveniently displayed on the Pioneer radio screen. The PIO/USB-51V will connect to the iPod/iPhone through the Dock connector and will convert the iPod data output to USB and the audio/video output to 3.5mm straight male plug for connection to Pioneer’s iPod/iPhone-ready multimedia receiver. Control your iPod through the Pioneer radio and play your stored videos while maintaining digital CD quality sound. The PIO/USB-51V will also charge your iPod/iPhone. 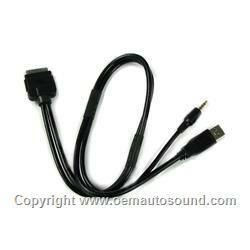 The PIO/USB-51V features a 2’ iPod cable to 3.5mm A/V plug, and USB cable. Link Search: In addition, Link Search allows you to play songs related to the currently playing song. Link Search lets you create an album list of the currently playing artist, a song list of the currently playing album. Time Search:Time Search lets you select a desired position (elapsed time) within a single track on your iPod/iPhone. Random & Repeat: You can also select random and repeat functions for a certain song, specific category, or your entire iPod/iPhone's music library. ability to control the iPod and display iPod content depends on which iPod models and firmware are supported by the Pioneer radio.